How did you keep your toddlers safe in the car? Our Mommy MD Guide’s reply: I believe it’s critical to keep kids rear-facing in the car as long as possible. It’s much safer for a child’s head and neck to ride rear-facing. In some countries, kids ride rear-facing until they’re five or six years old. I carefully researched which car seats can remain rear-facing longer. This was an important factor for me when I purchased my daughters’ car seats. 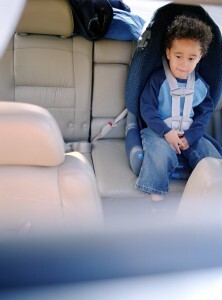 It’s important to check the car seat to see how long the child can ride rear-facing. My older daughter reached the upper limit for rear-facing in her car seat before she turned three years old, and I was very disappointed to have to turn her seat around.